Recent Testimonial : Thanks again for your fine hospitality while we were at Anishinabi! Can't believe I hadn't been there with the crew for six years...I had forgotten how beautiful and great it is! We all had a great time and enjoyed the variety of weather! We made it home just fine, although we had about a two-hour wait at the border. I have attached a couple of pictures from our trip and in fact I'll probably just send four or five at a time so the email isn't so big. I love the picture I took on Isabelle of the sunrise at 5:30 a.m. that morning...sure was peaceful and nice over there! Hopefully I'll be back next year along with my four sons! Recent Testimonial : Jackie and Jody, It has taken me longer than I intended to write this, but I just wanted to share with you what a wonderful time our family had at Anderson's Lodge this past June. I attached the photos of the Master Angler small mouth bass that I caught along with my mom, Arlene, and my daughter, Olivia. This trip was especially memorable for us because we introduced Olivia to Canada and to Anderson's Lodge for the first time. She keeps asking when we're coming back! Olivia is the fourth generation of our family to enjoy Anderson's Lodge, as her great-grandfather started coming up from Chicago in the 1960's. While everything was as good as we've come to expect, our guide, Trevor, really helped make this a memorable trip for us. He's a great fisherman and a thoughtful person that went out of his way to make sure every day was fun. I'm not sure when we'll all be able to come back, but I can guarantee that we all look forward to that time. Best wishes and continued success! Recent Testimonial : The replica of the 54" we got last year just came in. I poured a Crown Royal to celebrate the great fish, good times, and to finish this chapter of my Musky fishing career! There will be many more chapters yet to write!!! I am more excited than ever, and have Musky Fever worse than ever!!! Thanks once again to all who helped me, taught me, fished with me, and "picked me up" along the way; y'all played a bigger part than you realize! August 28, 2008 would NOT have happened without each and every one of you! Thanks also to the great people of Canada for allowing us access to their waters. 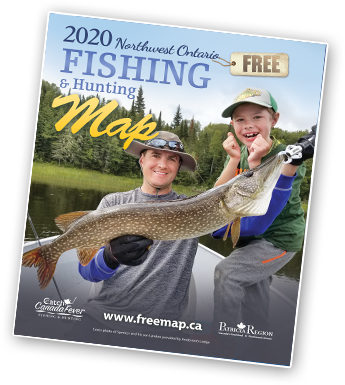 And finally, thanks to the Ontario MNR for their great Esox management and forward thinking (i.e. the 54" limit) on WORLD RECORD waters like Eagle Lake. As I hang this fish, I dedicate it to my late grandfather who used to fish with me all the time from when I was about 6 years old. He wasn't around to see this fish in person, but I know he was smiling down on us on August 28, 2008. He was there on my first Musky in 1988; he wouldn't even be able to comprehend a fish like this but would be proud. Good luck to those still lucky enough to be fishing for Muskies on Eagle Lake the remainder of the season. I hope you enjoy it, and realize/appreciate how special it is. Recent Testimonial : We have had a group of guys coming up to Allanwater Bridge Lodge opening weekend for over 25 years. Prior to coming to AWB we had tried other Canadian fly-ins but the fishing had never matched our expectations... Allanwater Bridge Lodge is a comfortable, friendly and relaxing camp the offers the best fishing we as a group have ever enjoyed.